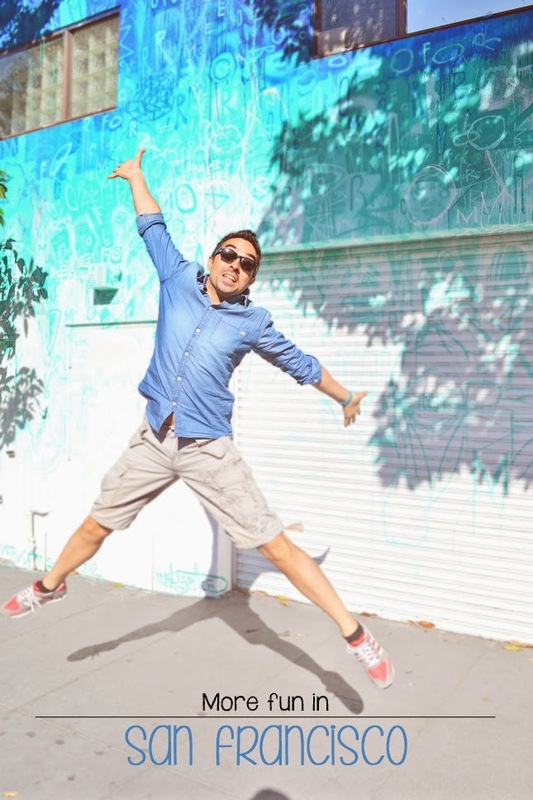 What better way to start a new Monday than with travel and fun? After last week’s first coverage of my recent San Francisco trip, here comes the second part of my happy voyage. 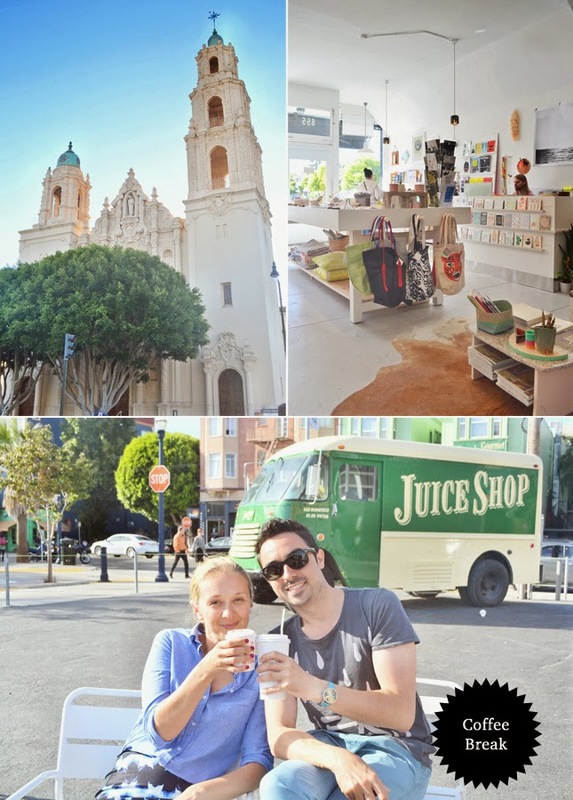 Today I would like to focus on some shops, restaurants and cafés – just to give you a bit more of the unique flavor of the city by the bay. I was a lucky duck cause I had local guides who showed me around and gave me real insider tips – Jordan of Oh Happy Day, Ana of Fluxi on Tour, Einat of Design Break Blog and Jeanne of Shop Sweet Things took me out on two subsequent days and made my trip not only cool but excellent. Thank you ladies! 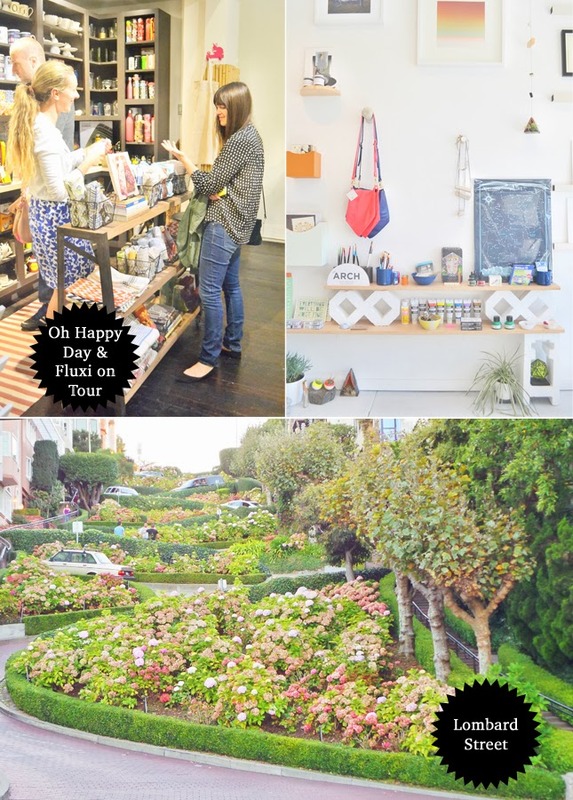 To begin with, let me name a few areas that are sort of hot spots for shopping fans: Valencia Street in the Mission, Filmore Street close to Pacific Heights, the Ferry Building in Embarcadero, and Hayes Valley. But let me tell you about a few places that inspired me most. Off record: Don’t miss the popular Lombard Street, also known as the crooked street, it is really lovely and the view of the city from up there is beautiful. Try to zoom out the hordes of tourists though. 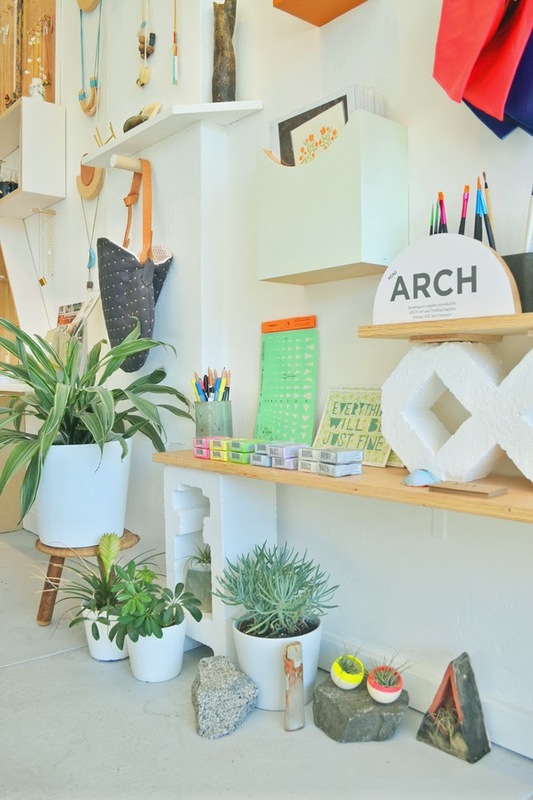 If you love a sort of curiosity shop with unique décor elements, lots of natural goodies like home plants and crystals, you will enjoy Paxton Gate on Valencia Street. It is like a curiosity cabinet and unlike any other store I’ve visited before. Of course, I was totally smitten by all the greens and bought an air plant and a vintage plant pot. 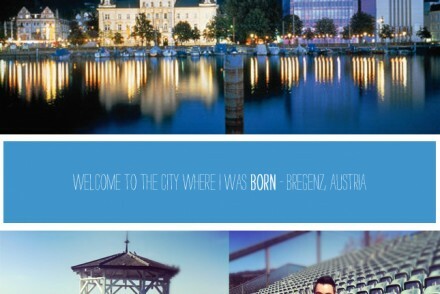 On the same street you will discover a pretty new store that is actually two stores in one. 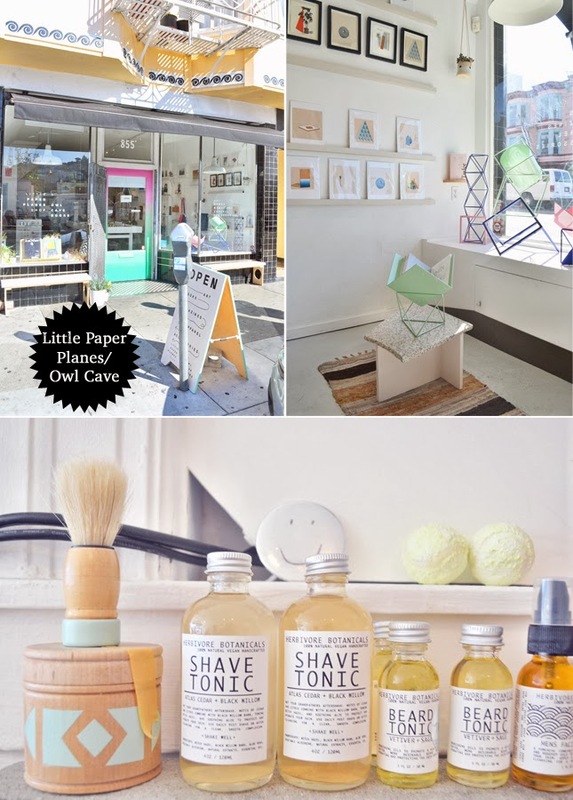 Until recently, Little Paper Planes and the Owl Cave were online stores but both owners united their forces and opened up their first mutual store in the vibrant Mission district. 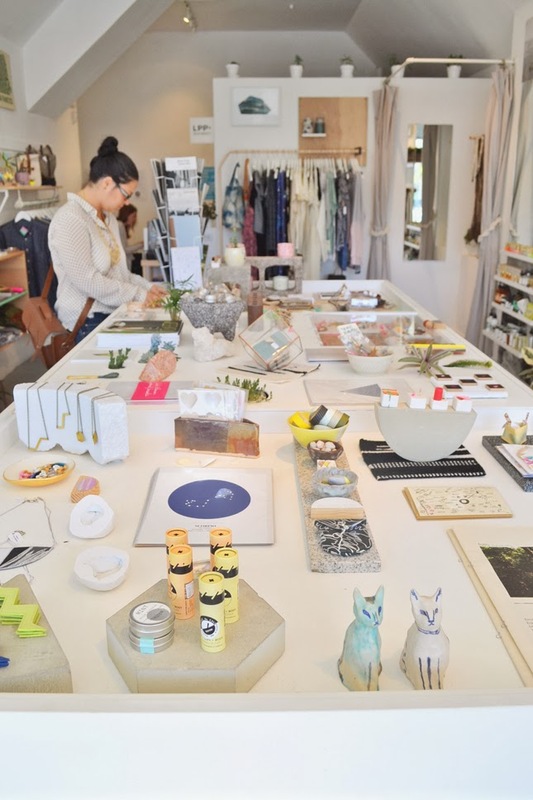 A fabulous assortment of fine homeware, books and magazines, handmade jewelry, fashion and body care products make it difficult to leave the store empty-handed. Here again, I bought a SF based magazine and some presents for a friend. Just opposite is Aggregate Supply, yet another cool store with home décor, home textiles, fashion and cosmetics – great to buy unique pieces just like my cast iron whale bookends. 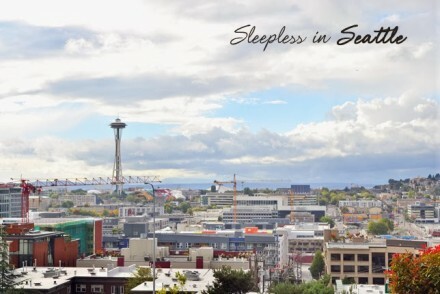 If you feel exhausted, you will find lots of great places to take a break in the area. 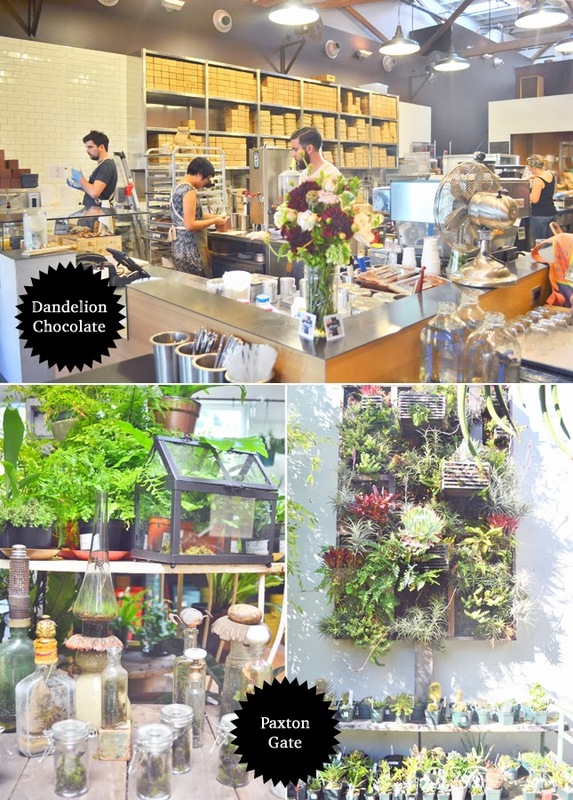 Chocoholics should stop by at Dandelion Chocolates. From the moment you open the door yours nostrils will encounter the warm and sweet scent of cocoa and you will feel the pheromones rushing through your body. I recommend the hot chocolate – rich, velvety and delicious! 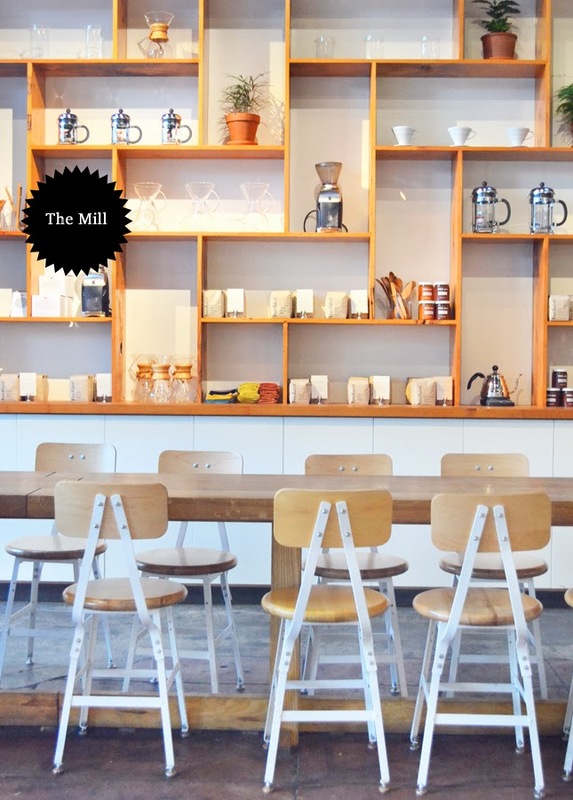 Coffee lovers should enjoy a cup of poured coffee made with a Chemex right in front of your eyes at the hip and trending café The Mill. Oh and feel free to taste some of their divine pastries or buy a loaf of freshly baked bread. 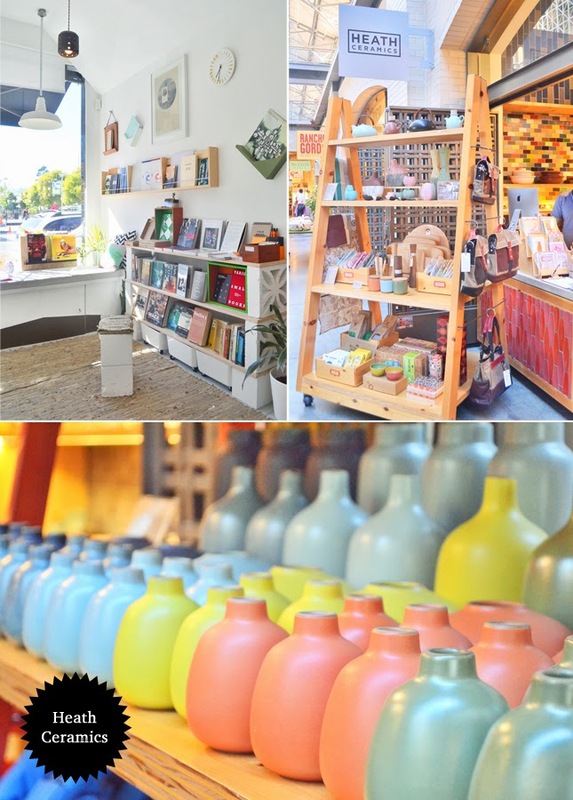 If you need more cool, unique and handmade goodies, head to Rare Device on Divisadero Street. The shop has a huge selection of art prints, many of local artists, that are ideal souvenirs. If you head to Filmore Street don’t miss the Jonathan Adler store, Steven Alan for great fashion and Le Labo for handmade, customizable perfumes and scented candles with fabulous packaging design (oh and they have a boutique in Paris too, I plan to go there in December). 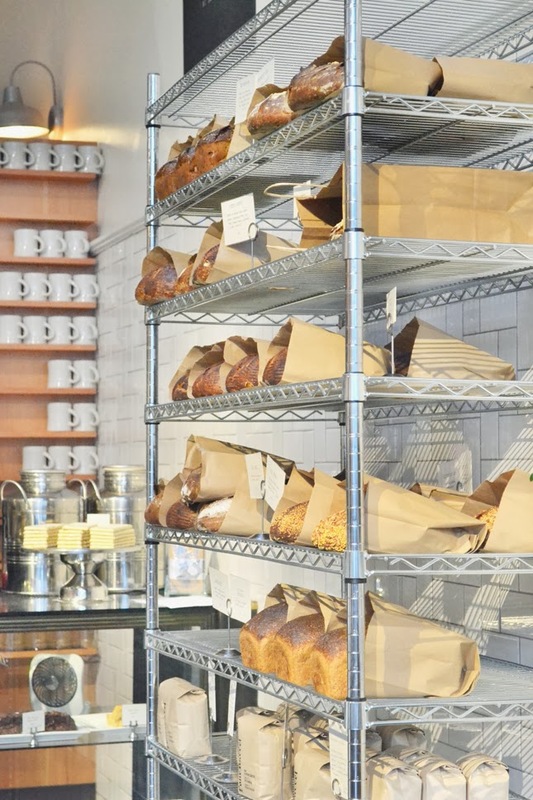 You can continue all the way to Hayes Valley for more shopping fun and lots of great sweets stores like Miette or the macaron place Chantal Guillon, coffee is great at Ritual Coffee Roasters and food is prime at La Boulange. Voilà! The popular Ferry Building in the Embarcadero district is another popular shopping destination. Lots of small shops and food stalls will entice you into roaming around and – consequently – shop. Heath Ceramics features a little store in the Ferry Building, the famous Blue Bottle Coffee is just opposite, and great, local food and produce are to be found there, too. I bought some amazing Californian olive oil from Stonehouse Olive Oil. Recommended! I’ll draw a line here and let you go into your Monday – hopefully a sunny, not stressful and above all happy one. Oh Igor, thanks again for another vicarious trip to SF. The Farmer’s Market at the Ferry Building is also amazing! And great food stands for breakfast and/or lunch as well. I loved the Ferry Building very much, Amy. Spent an entire afternoon there! Haha lieben Dank, Kasia!! Das war heute notwendig, denn München ist arg grau heute! Thank you my dear!! It was such a treat to meet you IRL and spend a great afternoon with you!! LOVE that first pic of you. Hope you’ll print it out and frame it!!!! 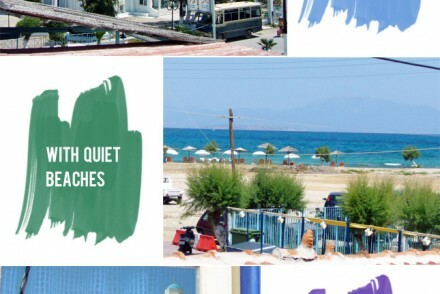 What a great selection of shops and stops and what better than have lovely bloggers show you round. I think you were treated more like royalty:-)) Glad you had such a fab time! Thank you for sharing. Haha that would be a bit egocentric to frame my own pic:-)) And yes, I must admit I was really treated royal by my blogger friends in the States! I am a happy chap!